SINGAPORE - Notwithstanding maritime disputes and bilateral tensions, the hunger for Malaysian food in Singapore has hit an all-time high. Five weeks after its launch, the Malaysia Boleh! foodcourt at AMK Hub continues to be thronged with hungry hordes. Long lines snake from the popular char kway teow and KL Hokkien mee stalls at the 8,000 sq ft outlet, which seats 300 people and houses 25 stalls. In the first two weeks of opening, queues formed every day at the foodcourt's entrance before it opened at 8am. This is the second Malaysia Boleh! outlet, which comes six years after the original 7,000 sq ft outlet opened in Jurong Point. Last year, that space was doubled to 14,000 sq ft. A third Malaysia Boleh! will open at Eastpoint Mall in March next year. To meet growing appetites, Mr Tan Kim Leng, 41, director of the Singapore-based Fei Siong Group, which owns Malaysia Boleh!, introduced a smaller-scale offshoot - Malaysia Chiak! - last year at The Centrepoint. Malaysia Chiak!, said Mr Tan, features a smaller assortment of the most popular dishes at Malaysia Boleh!, in smaller 1,000 to 3,000 sq ft venues. In the past year, the Malaysia Chiak! chain has grown to six locations, including Northpoint City and West Mall. Mr Tan says the consistency of food quality at all the outlets is maintained by preparing all sauces at the group's central kitchen, with ingredients imported from Malaysia. "The key cook in every stall is Malaysian. We control the recipe in the central kitchen and have a taste test every day before the foodcourt opens to ensure the flavour is true to the original hawker's recipe," he adds. Earlier this year, the group opened its first Malaysia Boleh! branch in Malaysia. The 8,000 sq ft food court is at Four Seasons Place, Kuala Lumpur. This move allows its staff in Singapore to receive training at the Malaysian branch and ensures a pipeline of trained Malaysian cooks, who are given the option to relocate to Singapore. Over at York Hotel Singapore, the popular Penang Hawkers' Fare buffet, which flies in hawkers from Penang to whip up famous street dishes such as Penang prawn mee and oyster omelette, has returned for the third time this year. Ms Joyce Yao, 36, its marketing communications manager, says the hotel hits its full capacity of 150 diners every time it runs the buffet. On weekends, it opens a function room to accommodate the overflow of diners. She says: "Singaporeans are willing to travel for good food, but they also want convenience. We also see a large population of Malaysians who crave a taste of home." Six years on, the 22,000 sq ft Malaysia Food Street at Resorts World Sentosa continues to thrive. Dishes such as Malacca chicken rice balls and Heun Kee Claypot Chicken Rice continue to sell out at the 750-seat foodcourt. It has added a new curry chicken stall and another pork noodle stall will open in February. Aside from these street food options, diners continue to indulge their Malaysian food cravings at the popular Penang Place buffet at Suntec City and the Penang Culture restaurant chain, which has outlets at Jem, Compass One and Nex. While patrons at Malaysia Boleh! and York Hotel are mostly aged above 50, increasingly, younger folk are joining the lines. 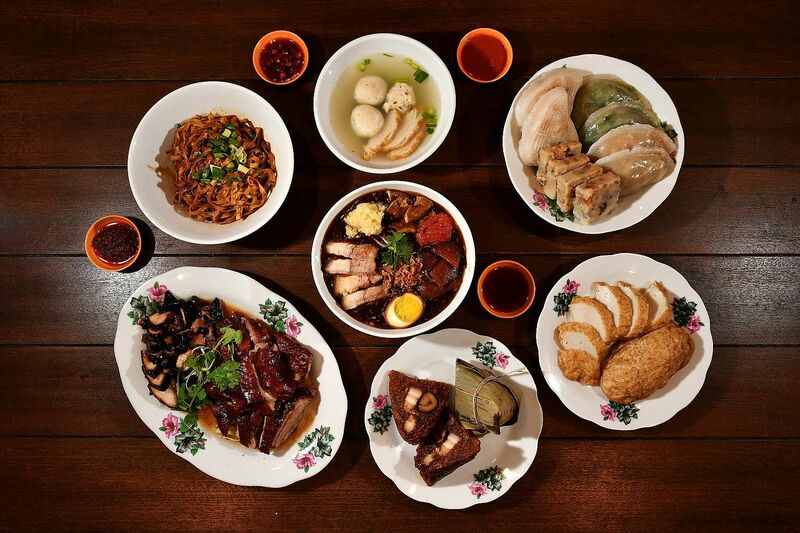 Why do Singaporeans have such an enduring love for Malaysian fare? Marketing manager Chloe Ang, 30, who enjoys going to Malaysia with her family for holidays, says: "When we dine at the Penang-style restaurants here, it reminds me of our travels over the years, where we spend most of our time eating." For Mr Larry Tan, 62, dining at Malaysia Boleh! in AMK Hub is a convenient option if he does not have the time to travel to Malaysia. He says: "There is good variety and the food is reasonably priced. While it can't beat dining in Malaysia, the flavours are not too far off." Some of the popular dishes being sold at the Malaysia Boleh! foodcourt at AMK Hub. Do not miss the char siew and roast duck from this stall. The char siew ($10 for a portion) has well-marbled tender meat, and a deliciously sticky glaze. Char siew rice is priced at $3.50, and duck rice at $3.80. The town of Yong Peng in Johor is known for dishes that use the xi dao (wolf herring or ikan parang) fish. Similarly, this stall uses xi dao fish for its fish ball noodles ($3.50, above) and fried fish cake ($3). Tuck into soon kueh, chive kueh, and rice kueh ($1.20 each), as well as yam kueh ($1.50) at this stall. A good breakfast option as it opens at 8am. What: A slightly different version of the lor mee found in Singapore, this one bowl wonder ($4) from Bukit Mertajam town in Penang includes pig skin and intestines. Get traditional rice dumplings all year round from this Penang establishment. The fragrant bak zhang has a pork belly and chestnut filling ($3). SEMPALIT CURRY CHICKEN, $8.50 The curry chicken, which harks from Sempalit, a village in Pahang, is made with a blend of dried chilli, cumin, coriander, cinnamon, garlic, ginger, curry leaves and coconut milk. The dish has been a hit with the village's Chinese residents since the 1950s, when its creator Damodaran Nair sold simple home-cooked Indian food from a pushcart. KL PORK NOODLES, $8.50 This signature noodle dish from Hong Cha Restaurant in Kuala Lumpur features a broth that is boiled for hours with pork and bones. It is then topped with pork slices, minced pork, pig's liver and pork lard. The stall opens in February next year. The Malaysian Food Street at Resorts World Sentosa is open from 11am to 9pm (Mondays to Thursdays)and 9am to 10pm (Fridays to Sundays and public holidays).